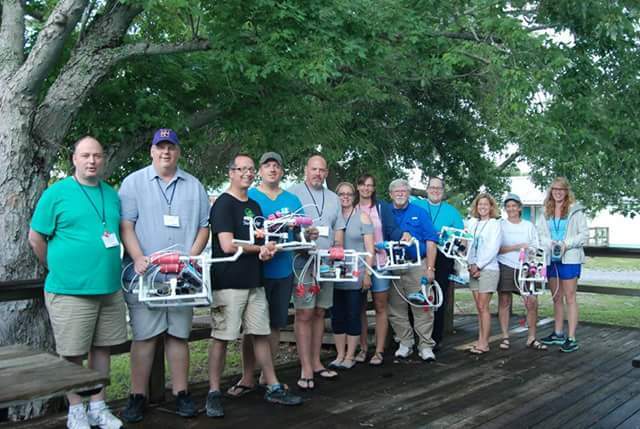 remotely operated vehicles (ROVs), explored the use of ROVs in marine science, and taught the educators how to build an underwater ROV from the ground up. from Alabama, Louisiana, and Washington state. enriched in learning a new technology." classroom at various levels, because they lend themselves varying levels of complexity." a CTD which measures conductivity, temperature and depth, as well as, trawling and collecting plankton. the Gulf of Mexico from the discovery of a tar lily to the undisturbed 1800s shipwreck. was shared with us as educators here is extremely important in bringing that back to our school and sharing that with our students." Lab's Discovery Hall Programs in the spring.